General Mayhem's Systar Starship from "The Lego Movie 2." Warner Bros.' "The Lego Movie 2" debuts today and just in time for opening weekend, retailers are slashing the price of Lego's new building sets. Lego Movie 2 Rex's Rex-treme Offroader for $24 ($5 off) at Walmart or Amazon. 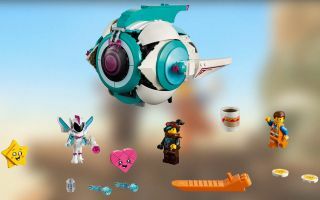 Lego Movie 2 Sweet Mayhem's Systar Starship for $56 ($13 off) at Walmart or Amazon. Lego Movie 2 Emmet & Lucy's Escape Buggy for $40 ($9 off) at Walmart or Amazon. Lego Movie 2 Pop-Up Party Bus for $63.99 ($16 off) at Walmart or Amazon. Lego Movie 2 Queen Watevra's Build Whatever for $32 ($7 off) at Walmart or Amazon. Lego Movie 2 Ultrakatty & Warrior Lucy for $24 ($5 off) at Walmart or Amazon. Lego Movie 2 Movie Maker Set for $40 ($10 off) at Walmart only. Lego Movie 2 Battle-Ready Batman and MetalBeard for $16 ($4 off) at Walmart or Amazon. Lego Movie 2 Emmet's Thricycle for $11.99 ($3 off) at Walmart or Amazon. Unfortunately, some sets like the epic Rex's Rexplorer Set ($120) are still at their full price. Nevertheless, you can shop Walmart's and Amazon's Lego Movie 2 sale here and here. Follow us @Spacedotcom and on Facebook.